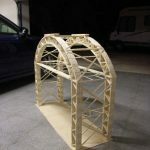 These are the photos of a popsicle bridge that I made for a bridge building contest at my university in Spain. The weight of the bridge was 3.9kg, and the bridge held 700kg without breaking. This gives it an efficiency score of 180. The dimensions of underneath the arc are 90cm x 45cm.